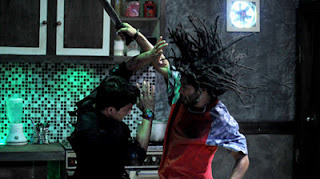 Fourth Row Center: Film Writings by Jason Bailey: #Sundance Review: "The Raid"
And thus begins Gareth Huw Evans’s masterfully constructed, smashingly entertaining Indonesian action extravaganza. Some have described it as “non-stop action,” but that’s not entirely accurate—this is a filmmaker who takes his pauses and lets us catch our breath (thank God). He knows when to put on the brakes and ramp up some tension, or how to use a momentary lull to deliver a good, hard jolt. He’s also technically proficient, moving his camera with a swift, ruthless efficiency, the cinematography rolling with the punches (sometimes literally). Evans has a tremendous sense of film rhythm (he edited as well as writing and directing), engaging in a scrappy, boisterous roughhouse style that sweeps an audience along; he tosses out action beats and gory kills like well-aimed fastballs. There’s a slightly aged appearance to the film stock, the faded colors and slight muddiness recalling early John Woo pictures. Evans is not just reworking Woo’s ballet-of-bullets aesthetic, though; when he grows tired of the guns, he puts his characters into a beautifully-choreographed knife fight. When that’s been mined, he goes to straight hand-to-hand martial arts. One could grouse that it’s awfully convenient that everyone agrees on how to battle it out, but the movie steams forward with such confidence that you go along with it; if it seems strange that no one brings a gun to a knife fight, credit to the director for finally having someone do just that, and being properly dismissed for his bad manners. The script is primarily an engine to get from one electrifying set piece to the next, but it wrings a fair amount of ingenuity out of its inverse Assault on Precinct 13 setup, and Evans has the good sense to create not one, but two chilling villains to augment the parade of disposable bad guys. His leading man, Iko Uwanis, has got the cool charisma and graceful athleticism of a young Jackie Chan—you believe he could take on this army of thugs and come out on top. It’s all worked out with deadpan humor and hyper-kinetic style, equal parts playfulness and terse, economical thrills. How disarming it was to hear this Sundance audience, filled with jaded press and industry types, left literally gasping by the gags and cheering like teenagers as the credits rolled. The Raid is a movie that works you over, and leaves you giddy in its wake. "The Raid" screens at the Sundance Film Festival on 1/22, 1/26, and 1/27.